It’s winter in Melbourne. It doesn’t snow here so, frankly, winter is cold, grey and uninspiring. And I really dislike the short days at this time of year. Frankly I’d rather be on the road, following the light and photographing the beauty it brings my way. I find I sleep a lot, do a whole lot of image processing and watch inspiring TV and movies during the winter months. Thank you Netflix. But I also make an effort, most days, to get out and about and walk in the light. More often than not I get caught up and it’s late afternoon or even evening before I start my walk. Fortunately I don’t have to walk very far, in the parks and by waterways in my neighborhood, before I become Strider scouting in the gloom for roaming packs of orcs. I feel it’s important to lose yourself in your own imagination, at least once a day. At this time of year it’s often the highlight of my day and it puts me in a very positive state of mind to blog and connect with the various online communities I manage. Red decorations welcome the visitor outside a hotel on Huangshan (i.e., Yellow Mountain) in China. One thing that’s good about winter is that it puts me in the mood for a bit of a spring clean. And that’s a great thing as I’m slowly working to rid myself of around 80% of my possessions. The idea is to be in a position where I’II be able to pack up and go whenever I feel the need, which is exactly what you need to do to be able to live the laptop lifestyle. Yes, I’m on the path to minimalism. While sorting through yet another load of books, CD’s and DVD’s my mind began to wander a bit and, not for the first time, I remembered my time on Huangshan (i.e., Yellow Mountain) in Eastern China. I only had three days journeying across the seven peaks that are commonly referred to as Yellow Mountain. Despite the fact that I did so in the middle of a Chinese winter, it remains one of the most incredible and personally rewarding travel and photography experiences of my life. Mist recedes at a most serendipitous moment to reveal a spectacular mountain view on Huangshan (i.e., Yellow Mountain) in China. 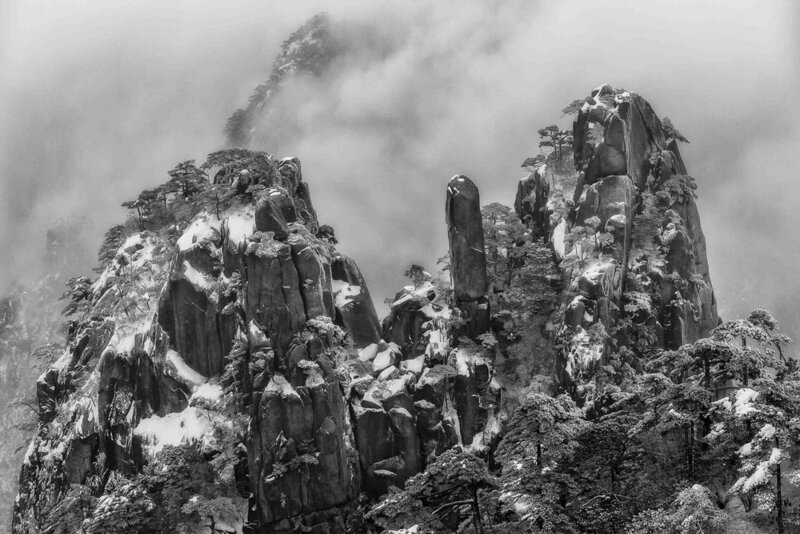 I first heard about the sublime beauty of Huangshan back in the 90's when an old friend, Moses Tan, showed be a coffee table book on the Yellow Mountain. It was full of atmospheric views of pine trees emerging from mist shrouded mountain sides. While I've traveled to China numerous times, since my first visit in 1988, it wasn't until January 2011 that I finally made it to Huangshan. 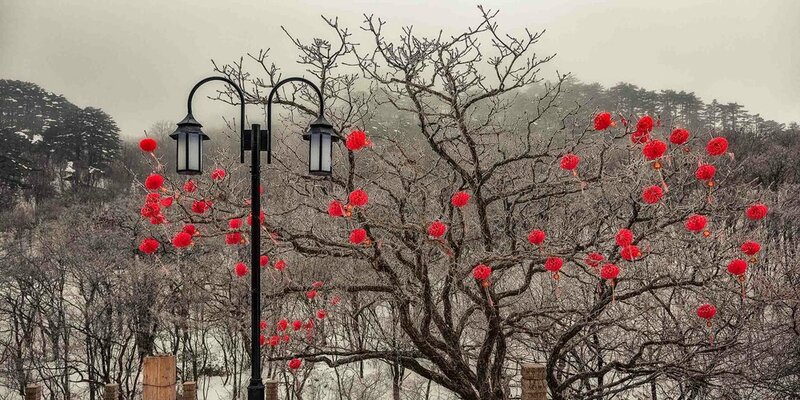 January is the middle of winter in China and, on Huangshan, the conditions can be tough, for tourists and workers alike, with minimum temperatures getting down to -20C at that time of year. But that was the least of my problems. Chinese visitors have been coming to Huangshan for thousands of years and, these days, the mountain receives several million visitors per year. The cold, blue light of dawn above the clouds on Huangshan (i.e., Yellow Mountain), China. But hordes of tourists don’t usually make for ideal conditions for landscape photography. Scheduling my visit for late January, the middle of winter in China, was the solution. I doubt I saw more than 100 people during my three day trek across Yellow Mountain. And most of those I saw around the buffet table at dinner time. 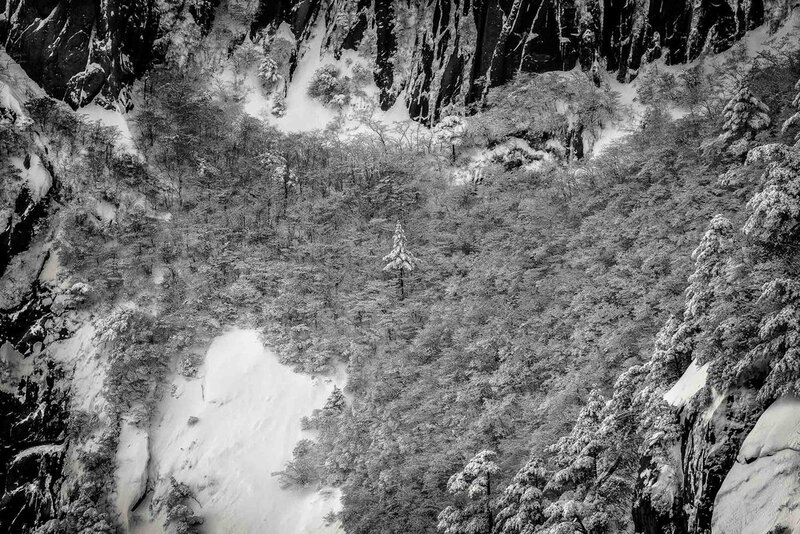 A lone tree stands, high above all others, on the steep slope of a mountainside on Huangshan (i.e., Yellow Mountain) in China. I love the company of people and, while traveling alone, have never had any trouble making friends along the road. In fact my birthday turned into a very merry night on the mountain. I was sitting alone eating fish, one of my favorite foods when traveling in Asia. But, in China, fish is often eaten as part of an important celebration. I’m used to being looked at when traveling, particularly in Asia. But I hadn’t felt so keenly observed for many years. Eventually someone came over and asked if today was my Wedding anniversary and if my wife had died. I explained that it was, in fact, my birthday. Well, before you could say Wealth Is Glorious, I was joined by local Chinese tourists from an adjacent table and we proceeded to have a wonderful evening. That made for two very interesting birthday encounters over a 24 hour period. The other one I’II tell you about when you’re older. What’s most important is that my time alone on the mountain, communing with nature, was amongst the three best days of my life, thus far. But that's not to say it wasn't hard. Trekking up and down steep mountain trails, in the middle of winter, isn't for the light hearted. And heading out of the hotel in the pre dawn light, at that time of year, does require a certain degree of determination. But life's what you make of it, and you don't get to experience much of the world asleep in bed. Though I do love my sleep. I remember making the photo at the top of this post. I climbed up through the mist to a lookout in search of a grand vista. As I reached the top the mist cleared enough for me to behold this amazing scene. An expansive composition, which I achieved through the use of a 24 mm focal length lens on my then Canon 5D Mark II camera, and a large depth of field was utilized to help realize the scale of this classic view. I knew at the time that the high degree of texture and tonality within the scene called out for a black and white rendering. Careful composition enabled me to design a journey, through the image, from front left to back right. It was then a matter of a little extra patience while I waited for the wind to stop long enough for the tree branches to remain still during the 1/25 second exposure. With no roads across the mountaintop Huangshan is an ideal environment for hiking. The main pathways are stone into which many thousands of steps have been cut. Yellow Mountain is a wonder to experience and a joy to photograph. Traveling there in the middle of winter wasn't without risk. But it proved to be the right decision. And my photos have helped record that experience and my memories of that most beautiful place. Maybe I'II see you there, one day. I do plan to return, next time for a more extended visit. Want to be a Fashion Model?